Our BC Senior Teams are ready to go as they are prepped and awaiting the start of the 2018 Canadian Senior Triples Championships, being held this year in Calgary Alberta. Teams from across the Country have gathered for a week of Bowls, Friendship and a great time on the greens. 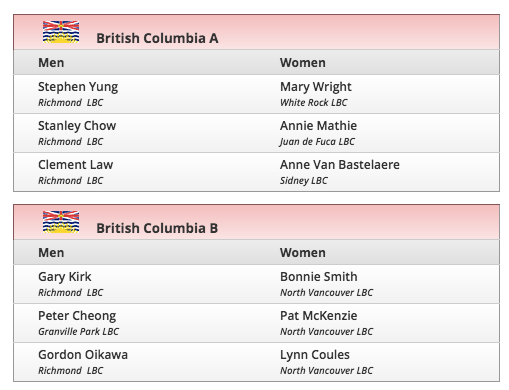 This year British Columbia will have two teams for both the Men’s and Women’s division, as BC A and BC B will be in full force. Best of luck to all the Bowlers at this years event. Calgary Lawn Bowling Club as part of Lawn Bowls Alberta follows the Long Term Athletic Development Model (LTAD). In doing so we recognize that bowlers can start at any age and move through the stages at different rates. We help our members be active for life and have activities suited to the different levels of bowlers; recreational bowlers who just want to be active and enjoy the sport, competitive bowlers who want to be active, enjoy the sport and compete as well as very competitive bowlers who also want to play at international levels.